You have the best chances at nipping illness in the bud if you start taking medicine right at the onset of symptoms. You can help prevent getting sick by boosting up your immune system before or at the time of exposure. But at the latest you want to start attacking it the second your head starts feeling funny, your throat gets scratchy, or you become lethargic and achy. It is NOT wise to wait until after you are sick (or injured) to go the store to pick up your basic healing remedies and supplies. It may seem common sense but let me ask, is your cabinet well stocked? Being prepared will set you and your family up for the best possible outcome when illness strikes. Especially if you want to avoid having the full-blown symptoms and/or you prefer using more natural methods to heal. 1. When you aren’t feeling well, it’s hard to think clearly, let alone make sound decisions about what is the best option to buy or take. For myself, I often know how to help other people when they are sick to feel more comfortable, but when I am not well, I don’t always know what I need. I can’t think straight. 2. You risk exposing and spreading germs to others by going to the store ill. While working in the supplement department of a natural food store, a customer came in with the full-on flu (feverish and weak) looking for something to help her recover. A day later, I got the flu and I was in my 7th weeks of pregnancy. Please don’t risk exposing others by going to the store yourself. Thankfully, I did have what I needed at home. 3. It’s better if you don’t have to send someone else to store for you. Especially if that person isn’t familiar with the products you use or the store you shop at. 4. You are more likely to miss that window before full-blown symptoms arise and set in. You’ve got to get to it at the onset. Have your medicine cabinet prepared, stocked and ready for anything. Plants are teeming with phytonutrients that our body recognizes and can utilize to cleanse, detoxify, protect, nourish, and build with. There are numerous plants and other elements in nature that are rich with antiseptic properties. That ward off pathogens without creating resistant superbugs or stripping us of our good bacteria in the process. Intelligent and dynamic molecules that will assist your body in repairing. Having even basic knowledge about how to support your own health before illness strikes are the ultimate in being prepared. Also read: #3 Understand Basic Human Physiology and Nutrition. Here are some basic things you may want to include in your own medicine cabinet. I’ve included links to some of my favorite products and a few quick resources that give you an overview of benefits and precautions. Consult with your healthcare providers before taking anything. Do your research, speak with representatives and associates in the natural medicine world so they can assist you in finding what you are looking for with safety and efficacy. Natural-Herbal Remedies such as elderberry syrup, goldenseal, echinacea, oregano, astragalus root, bee products (honey, propolis, etc.) or blends to support your immune system and break up and expel mucus. Homeopathic Remedies such as Oscillococcinum® or Umka® to help reduce symptoms of cold and flu and help speed up recovery time without side-effects. Highly diluted elements work to shorten the duration of viral infection by activating the body’s own immune response. ** There are some basic and rather important things to know when using essential oils. Please use caution and do your research before purchasing them. This blog is intended to help one make sure they are stocked up with the basics (we will save the topic of choosing essential oil brands for another entry). Raindrop Technique (RDT) is an aromatherapy technique that everyone can learn to do at home. I know of nothing better for viral outbreaks and we use it in my household anytime someone in our family gets sick. There is some important know-how when using these potent oils. Like what to do if you get an essential oil in your eye or how to cool it down if the burning sensation gets too hot. Some training is necessary. Once you know how to apply the oils, it is an easy and effective tool. Having an essential oil diffuser or humidifier is helpful for a couple of reasons. It helps oxygenate your body by opening stuffy sinuses, hydrates your airways, and eases breathing. Adding aromatics to your water can assist the respiratory systems of those who breathe it in. It can also help quarantine or clean the air around the contagious person, protecting the caregivers and family members from becoming ill.
Nasal rinses (sprays, neti pots, etc.) are a must if the sinuses have become filled with mucus. I make it my goal to get and keep the mucus clear when we are sick at my house. Mucus is the barometer of health returning after an upper respiratory infection has set in. Nasal rinses assist your body in washing out infection within the head and makes breathing less labored. Bentonite Clay or Activated Charcoal – is a must have in cases when a bacterial/parasitic insult or intestinal upset (i.e. states of high emotioanal stress or allergic reaction to food) has occurred. They help absorb poisons in our guts so that our body can eliminate them more easily. I wouldn’t want to be caught without one of these if I have an unfortunate exposure to contaminated food. Digestive Enzymes – helps assist the body in metabolizing food, converting what we eat into smaller parts. They help break down food, waste, cellular debris, and to turn over new tissues from old. They deliver the body nutrients needed to repair, heal damaged tissue and heal inflammation. Probiotics – are the front line of your immune system all throughout your body but are found in astonishing numbers in the gut. Healthy gut ecology requires there to be far more good bacteria than bad bacteria ratios and can make an incredible difference during times when our belly becomes infected with an icky bug. Probiotics loyally protect us from destructive pathogens and manufacture a bunch of vitamins, aminos, fatty acids, antioxidants, and coenzymes. They help regulate digestion and maintain healthy tissues (such as your gut lining or any other mucous membrane). Organic Whole Leaf Aloe Juice – aloe is one of those A-Z medicinal plants, like frankincense or lavender. It is nutrient profile is rich and is renowned for its regenerative properties – helping to heal burns, scars, ulcers, and leaky gut. It’s great for the liver/gallbladder detoxification, acid reflux, upset stomach, and is a gentle yet effective laxative. Essential Oils – there are many oils that can be massaged over the belly or ingested (tea or capsulated) that can help in numerous ways. 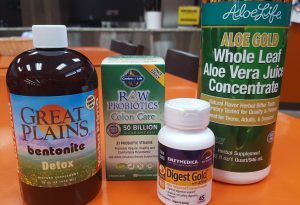 I have a couple digestive blends that I always keep handy for when a tummy ache strikes. They aren’t the most pleasant smelly oils in my oil collection, but man do they work! The most basic essential oil or tea for stomach problems is peppermint. Ginger – comes in every form you can think of (chews, crystalized, syrup, pill, powder, or fresh) and can calm spasms in the intestines and encourage normal peristalsis movement. Peppermint – also helps soothe the stomach, stimulates digestion and cools too much heat in the belly. Being prepared before something goes awry gives you the best chance for mending any ailment in the body more quickly and more efficiently. I hope these resources have at least help lead you to be more prepared for when being exposed to illness. In writing this, I realized I have a few important items things missing in my own cabinet and plan to take care of that stat. Cheers to living an embodied life! Beyond being a massage therapist, Shalene’s calling is to help deepen the relationship her clients have with their own nature, by helping them re-establish a close relationship with their bodies, and with the foods and lifestyles that nourish them.